Shell is the organically formed hard outer part of a saltwater or freshwater animal. Shells of all types have been used in jewelry since we first began to adorn ourselves, early beads and pendants were simply shells with a hole in them. While whole shells have always been an important part of jewelry, carving decorative objects from the inner layers of certain mollusks is an important refinement that evolved over many centuries. Shell Cameos are carved from mollusks that have two inner layers, typically a white layer and an underlying brown, pink or orangish layer. Cassis Mollusks which include the Helmet Conch, Cameo Conch, and Queen Conch, have a brownish or orangish background. Strobus Mollusks, including the Giant Conch and the Fountain Conch, have a pink background. The outer darker layer is removed and shell cameos are cut, not carved like hardstone, from the more beautiful inner layers. Etruscan Revival Mythological Shell Cameo. Around 1500 artisans in Italy and France began to carve these shells into cameos depicting portrait profiles, groups, historical scenes, mythological motifs, architectural motifs, a wide variety of subjects. 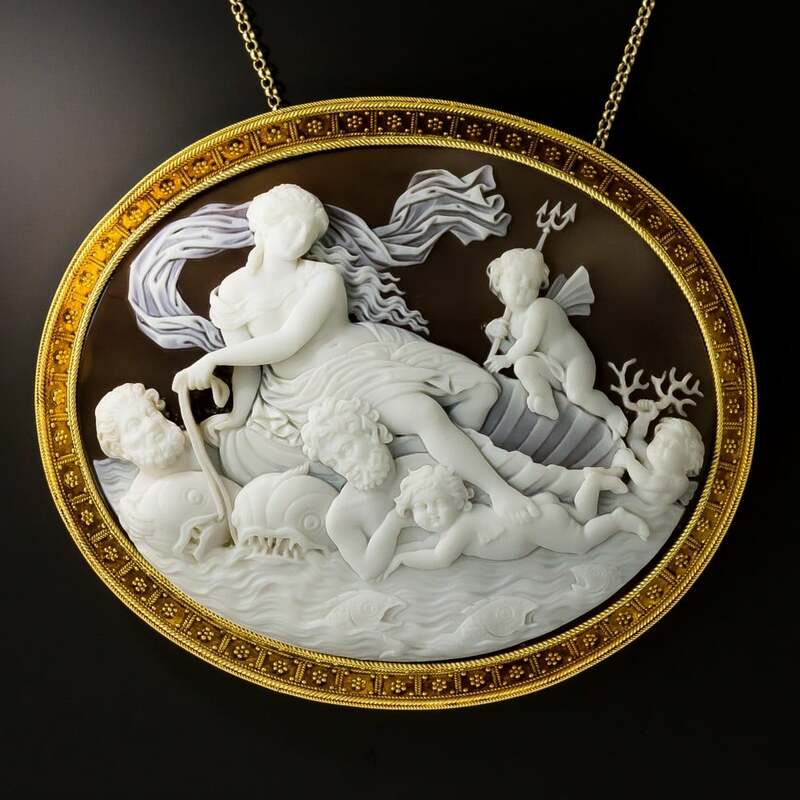 Victorian England popularized the shell cameo’s use as a jewelry necessity. While still popular today with collectors, plastic and other imitation cameos have greatly diminished the market today. 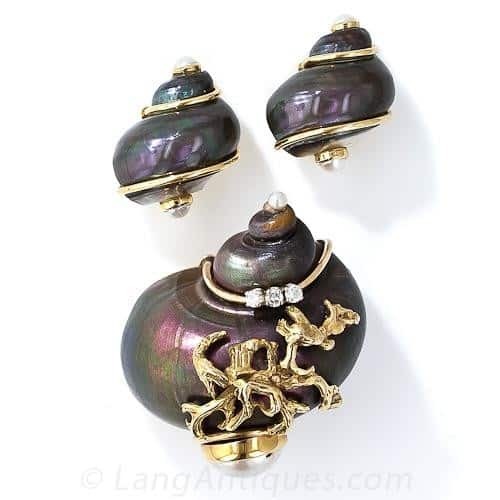 A further use of shell in jewelry and objets d’art includes the inner nacreous lining of some mollusks, such as abalone, known as mother-of-pearl. Buttons, cameos, carved plaques, inlay, combs and many more items are made from or adorned by mother-of-pearl. Seaman Schepps Shell Earrings and Brooch Suite. Gem Reference Guide, Los Angeles: Gemological Institute of America, 1988. Pp. 1212-213. Newman, Harold. An Illustrated Dictionary of Jewelry, New York: Thames and Hudson, 1981. Pp. 277-278.